My friend Jackie just returned from her native New Orleans for a Mardi Gras celebration. 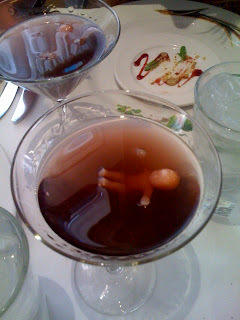 She showed me this picture and I couldn't help but wonder, " is this is the rudest cocktail I've ever seen?" Tell I'm wrong. oh my goodness! you already know how i feel about things like this - irrational fear of an aborted fetus in a public toilet notwithstanding. not just rude, but creepy-rude.